Blogless from to0 little to talk about, to Blogless from too much to talk about. I need a place to host this photo, so I am turning to Blogger to do so. I modded my REBA fork yesterday, so here is the write up. Well I installed a 15mm spacer yesterday with ease and success! The whole process was about 25minutes taking my time. First, no need to remove fork lowers for this like RS claims. First, clean fork thoroughly removing all dirt and debris. 1) Remove air from Neg chamber. 2) Remove air from POs Chamber. 4) Remove 20mm? Nut/housing for Pos Chamber Schrader Valve. ** Be careful NOT to let dust and debris get into fork. 5) Compress fork and use a plastic/rubber mallet to tap the Neg. Chamber valve into the fork. ** This works best with the nut installed so that it's flush with the valve (Step 3). 6) Once loose, you can remove the nut and push the valve into the fork leg. Now find a 6mm Allen T-handle works to push the assembly to the top of the fork leg. ** Note that having the fork collapsed lessens your need for a long "push" rod. ** I also say 6mm because it is large enough to not damage the valve by accidentally pushing on the valve core. Add/remove your spacer(s) and reinstall reversing above steps. ** I added about 5cc of fork oil before assembly, this is your choice. ** be careful to not over tightened the 10mm on the Neg chamber. Here are some photos of the fork before and after the 15mm spacer install. 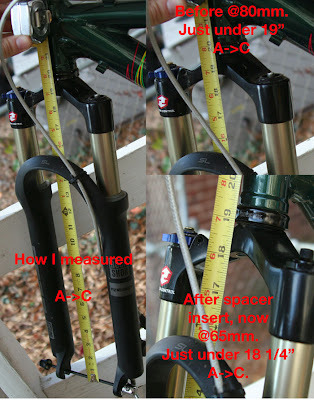 I took the fork from 80 to 65mm. This DOES drop your A->C (Axle to Crown) from approx. 19" to just under 18 1/4" which will effect your handling. It steepens your HT angle, something that I desire! The bike does handle faster, in fact I found myself having to make slight corrections during my steering input as I was doing a little over steering, but by the rides end life was very good. The whole ride was spend without wanting to lockout my fork, while I normally do on climbs and sprints. This mod DOES NOT stiffen the compression perse' but on some level it seems to steepen the rate at which the air chamber works. IE: It feels more like a "coil" fork than a air fork now. I also never bottomed out on the ride.